When you talk about treadmills, one name pops into mind almost immediately: NordicTrack Treadmills. 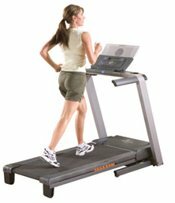 NordicTrack is a brand name for home exercise equipment; the best known is, of course, the treadmill. A treadmill is a piece of equipment that has a moving track that you walk or run on. This provides what is called "cardio" training and is vastly popular worldwide.Treadmills became very popular in the late 1980's, with the explosion of home exercise videos and workout programs. Using a treadmill at home became a status symbol of sorts, and the NordicTrack brand gained popularity. This continued until the mid 1990's, when sales bottomed out and a design infringement suit was filed by Icon Fitness. Icon won that litigation and as a result, NordicTrack was forced into bankruptcy. Ironically, Icon Fitness (the world's largest supplier and manufacturer of home exercise equipment) took over and now produces the NordicTrack brand. NordicTrack treadmills are still sold today at various outlets, on eBay, and other auction type web sites, as well as second hand distributors like 2nd Wind Fitness. They are available in several price ranges, from $699 to over $2500 for the professional models. The most popular NordicTrack models are the mid-range models (under $1000) including: the A2105, A2250, A2350, C2155, C2255, C2500 and the commercial 1500. As I was looking at treadmill review sites, it became apparent that NordicTrack is no longer the brand of choice among consumers. Icon touts their army of engineers and use of imported parts to keep production costs down, but reviewers say that the machine quality has suffered as a result. As a matter of fact, most of the review sites don't even list a NordicTrack model in the top 10. Of course, reviews are mixed and you can find positive ones as well. The reviews at Treadmill Doctor pretty much say that NordicTrack has recently stepped up their machine quality and they recommend NordicTrack for different reasons. When you look at customer service after the sale, you get a completely different picture. Users report negative experiences with Icon's service division. This is unfortunate for the consumer and from the volume of reports, it is apparent that improvement is needed here. Parts availability and delivery is the most common thread. As far as construction of the machines, NordicTrack definitely is lightyears ahead of the competition. Lightweight and foldable, NordicTracktreadmills are made well and look good in the home. What I did notice, however, was an amount of reviews concerning the power components. One reviewer said that a machine in the $1000 range needed a more powerful motor to drive the treadmill belt. The specific model he was reviewing had a 2.0hp motor. He felt that a machine in that price range should have at least a 2.5hp drive motor. All in all, I would say that the average review of the NordicTrack treadmill is on the positive side. In reality, there are many new brands available on the market. The competition is absolutely fierce and reviewers do tend to have their preferences. So, read the reviews with a grain of salt, go to the fitness store and try one on for size personally. This is the only way you will get a feel for any specific machine.